That Santa Fe Go Club is a chapter of the American Go Association – the controlling body for amateur player ratings in the US. Go players have been meeting at St. John’s College for many years. No experience necessary — it only takes a few minutes to learn how to play. Experienced players also welcome. 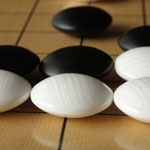 Go is the oldest game in history. Come see what you've been missing. The Cyclone Go Club is a humble group of Go players affiliated with Iowa State University in Ames, Iowa, although anyone is invited to attend. Fort Myers Go was founded in 2006 by a group of casual go players. We’re always interested in getting new people into the game, so if you’re a beginner, don’t be shy. There are always stronger players willing to give teaching games.